Coming at the dawn of my buying 45 singles, I ran out and bought this the second I heard it on the radio (which was probably WABC-AM). Was that a boy or a girl singing? What's that cool bass line? Are they singing "I'm your Venus" or that word that rhymes with Venus? In 1970, the Colossus record label was importing Dutch bands fast and furious. 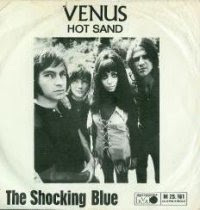 Shocking Blue was probably the biggest hit the label had, followed by The Tee Set's "Ma Bell Amie." Studying the 45, I was digging these Dutch names on the credits, and then the girl with the big hair on the cover. It turns out she was the one singing the song. Hmm. And since she knew no English, she was singing it phonetically. "Venus" was about as perfect a rock song for the time as you could ask for -- that insane bass hook, totally catchy verses and chorus ("I'm your Venus/I'm your fire at your desire"), that shouted out "wow!" at the breaks, and the strangely country-ish Fender licks. It was so good, that the girl group Bananarama made a disco version hit out of it in in the late 80's. There are an amazing amount of Shocking Blue videos on the web. They seemed to lip-synch their way relentlessly around the world when "Venus" was a hit. Consistently, each of these videos has the guitarist strumming his electric guitar during the acoustic parts (!!) and no organ in sight during the keyboard parts. For a real kick, you can click here to see lead singer Mariska Veres 30 years later performing "Venus" finally with a live band on Belgium TV -- my my, did she change! Sort of like the Dutch version of Heart's Ann Wilson. Anyway, here's one circa 1970 that really stands out, shot with the band playing on a beach somewhere and riding horses!